If you’re leaving home comforts behind for the first time and heading off to college or university the first thing you’ll notice is how quickly you’ll be able to spend money. No doubt you’ll have never really had to budget for things such as utility bills and the weekly food shop – Mum and Dad will have probably taken care of that for you, but budgeting for yourself and all your student needs is sure to be a culture shock for you. These days, you’re likely to have a student loan and, no doubt, a bank overdraft too and yet we’re constantly hearing in the newspapers about the increasing levels of student debt which begs the question…. Why do Banks and Lenders Target Students with Credit Cards in the First Place? With company redundancies and people hopping from one job to the next, it’s often quite difficult for banks and other lenders to work out which groups of people are the most likely to prove worthy customers to them over the long term. Remember, the banks are only interested in making money and they figure that the more money a person earns over the course of their lifetime, the more likely that person is to invest in more financial products like savings investments and pensions and the more expensive their tastes will be when they come to buy a house or car etc. and, of course, these expensive tastes will need financing in terms of mortgages, loans etc. Therefore, it follows suit that they see students as the potential high earners of the future which is why some companies have even started to offer student credit cards as a way of luring them in. Students should not be sucked into believing that they’re going to benefit exclusively from their ‘student’ status when being targeted with a student credit card. Usually, a student credit card is all about the bank’s particular marketing strategy which has been formulated and targeted specifically at students. The card companies will often offer incentives for you to take out their card. These may be in the form of offering savings on CDs, DVDs, computer games or discounts in certain clothes shops, yet you’ll often be able to get the same discounts and benefits using your National Union of Students (NUS) card so don’t get sucked in. Some companies do offer some worthwhile incentives with their cards such as offering free travel insurance with the card, which could obviously be quite handy if you intend to go backpacking at some point. That said, you’d need to check out if the insurance policy adequately covers you for any particular trip you may have in mind. 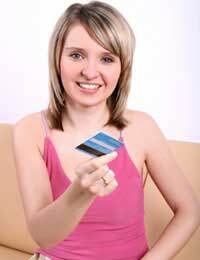 The fact is that a credit card aimed specifically at students does not offer any kind of preferential rate. In fact, the APR can often be much higher than some other conventional credit cards so it’s important to do a comparison search on all cards before making a decision. Most students notoriously struggle to make ends meet already and it’s important to ask yourself if you really need a credit card before going ahead. You’re likely to graduate with enough debt as it is so do you really think that additional access to credit is that good a move? However, if you’re good at managing a tight budget, they can offer you added convenience and an additional source of money if you only use them to tide you over for a short period of time until you get your next student loan installment and can pay what you owe back and in full, preferably. Things like DVD rental stores and if you want to rent a car on holiday, for example, often require a credit card to pay your deposit and for security. And, if you are travelling abroad, it’s often more preferable and, indeed, safer to carry a piece of plastic instead of carrying large sums of cash with you.However, you should do some research and consult with both your parents and with financial advisers as to whether or not you should be considering a credit card and if so, which one before going ahead. The APR rate is a good starting point. Also look out for 0% APR introductory offers and make sure you pay off the outstanding balance before the offer period ends and then switch to another 0% introductory card. Providing you keep paying off your balance by your next payment date, you’ll never be charged interest but also keep an eye out and avoid those cards which charge you an annual fee simply for having the card. Make sure you can realistically afford the repayments. It may be far better for you to learn how to budget and to save for the things which you desire and then pay for them in cash. You can be sure you’ll appreciate things far more if you’ve had to save for them and you’ll be learning some valuable financial management skills into the bargain. Very little we can buy is worth getting into debt for so make sure you’re aware of all the facts and know about the consequences before you commit to a credit card.